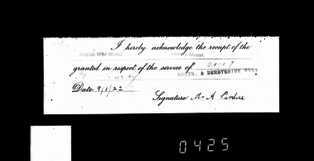 John Purdy is commemorated on the Jacksdale War Memorial as ‘J Pirdue’ but all of his military records, his Medal Rolls Index Card, the CWGC and ‘Soldiers Died’ all list him as Purdy as that is the name under which he attested. John was the son of Anthony Pirdue snr. He was born in Pontypridd, Glamorgan in 1888, but grew up at New Brinsley, Nottinghamshire, later moving to ‘William Cottages, 6 Albert Avenue, Jacksdale. He had brothers James, Joseph William, Anthony jnr, Ernest and Walter and two sisters Sarah Emma and May. 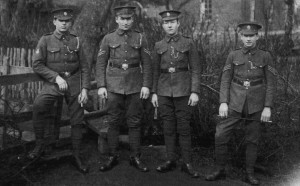 His brother Anthony was well known as a waiter at ‘The Portland Arms Hotel’ in Jacksdale and is listed on the Jacksdale War Memorial as having served during World War One. 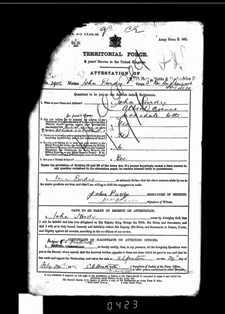 John enlisted at Alfreton, Derbyshire on 24th February 1915 for the duration of the war. He was aged 26 years and 4 months and gave his occupation as coal miner. He had light brown eyes, fair hair and a fresh complexion and was of larger than average stature for the day being 5 feet 10 1/2 inches tall, weighing 140 lbs with a chest girth of 39 inches. John served at home in the UK until 12th October 1915 when he sailed from Southampton to Rouen, France as part of the expeditionary force. 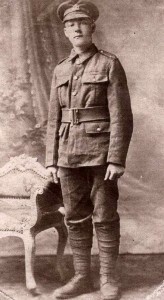 Within just a few days, with effect from 16th October 1915, he was serving with the unit in the field. John was recorded as missing in the field on 1st July 1916 and his military record states that death was accepted as occurring on or since that date and that he was presumed to have died, killed in action on Saturday 1st July 1916, the first day of the Somme Offensive. Age at death 27 years. A letter from the Sherwood Foresters Record Office at Litchfield, dated 4th March 1921, states that Private J Purdy, previously had a service number of 3955 and that he was entitled to the 1914-15 Star as he served in France from October 1915. 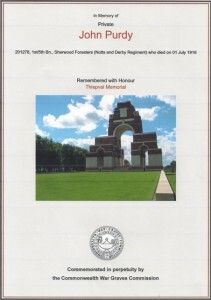 A further letter, from the Sherwood Foresters, dated 6th May 1922 gives his service number as 201278 and states that he was entitled to the British War Medal and the Victory Medal. The medals were accepted posthumously by his father Mr Anthony Pirdue of William Cottages, Albert Avenue, Jacksdale. Personal effects amounting to £6 2s 5d were sent to his father Anthony in August 1917 followed by a war gratuity of £5 10s in October 1920. Commemorated on the Thiepval Memorial, Somme, France, which bears the names of 72,000 officers and men who have no known grave.